Hopster.TV has a special collection of spooky preschool episodes, that is a child-friendly, safe and educational app to entertain kids with a selection of wicked kids shows, music, and games that is guaranteed to get them excited about the big day of Halloween. The Hopster app is free to download from the App Store and Google Play and is also available on Roku and Apple TV. After a complimentary one-week trial, the cost of a subscription is $6.99/month. With one subscription, families will get access to 1000s of preschool episodes, songs and educational games on all their devices all year with specially themed areas and new content added regularly. 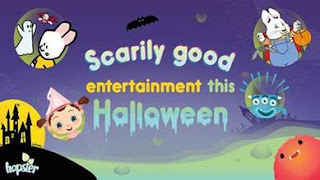 Some of the shows you will see are Moshi Monsters, Learn to Draw Minis-Bat, Louie-Draw Me a Ghost, Franny’s Feet- Halloween Harvest, Max and Ruby Max’s Halloween/ Ruby’s Leaf Collection/ The Blue Tarantula, 64 Zoo Lane- The Story of the Monster in the Forest, Monster Match Game and so many more. The Hopster app is free to download from the App Store and Google Play and you can also find it available on Roku and Apple TV. After one week free trial the cost of the subscription is $6.99 a month with one subscription, families can get access to thousands of preschool episodes, songs and educational games on all their devices all year with specially themed areas a new content added regularly.